Calls for a more inclusive style of capitalism are boosting a budding industry. On the face of it, 2016 was a tough year in the financial markets in general and for socially responsible investors in particular. Returns to active managers in both the public and private markets generally lagged behind the major benchmarks and, in many cases, the performance of socially responsible assets suffered disproportionately. This was disappointing to proponents of socially responsible investing (SRI) after a strong 2015 when SRI largely kept pace or outdid broad public market indices. The slowdown also reignited common criticisms or misperceptions of the investing style that have come to plague its progress. These include: the notion that there are forced trade-offs between financial and social returns; there is a lack of clarity in the investment process; and the space is dominated by specialist investors, not mainstream ones, starving the sector of significant capital. This has masked several developments that are reshaping the industry and allowing more meaningful amounts of capital to flow more efficiently to professionally managed opportunities, positioning the industry for more sustained growth. Among these developments are a broader and more sophisticated array of institutional participation; increasing demands from stakeholders for a more inclusive form of capitalism; and tweaks to the interpretation of fiduciary obligations that allow managers to consider the non-financial aspects of SRI in the interest of long-term returns. In December 2016, the well-recognised private equity firm TPG announced that it was sponsoring a US$1 billon impact investing fund. Bain Capital, another first-tier private equity general partner, has announced that it expects to launch an SRI themed fund in 2017. Morgan Stanley is approaching final close on its Integro Impact Investing Fund product1 and even Goldman Sachs is actively invested in the space. What’s changed? The populist movements that burst onto the world stage in 2016 reflect a growing sense of disillusionment with unfettered global capitalism and the desire to balance or redistribute the nature of returns. This can be seen in more ‘hands on’ or activist policy approaches by governments – whether U.S. President Donald Trump’s vocal efforts to ‘on-shore’ jobs or through fiscal initiatives like the proposed border tax. Asset managers are not immune or insensitive to these larger pressures and are responding with greater efforts to augment their financial return seeking with a broader interpretation of stakeholder interests. In this regard, a recent U.S. Department of Labour bulletin on the fiduciary duties of Employee Retirement Income Security Act (ERISA) managers is a step forward. This reinterpretation allows for circumstances where the consideration of non-financial factors (including environmental or social factors impacting shareholder value) in long-term positions is permissible, thereby reducing the perceived liability risk of such actions. Other jurisdictions have typically had more lenient and less litigious investment policy approaches but the U.S. controls the largest pool of professionally managed assets so this change is significant. While this small but meaningful regulatory guidance doesn’t address the question of trade-offs between social and financial returns, more elegant approaches are emerging. 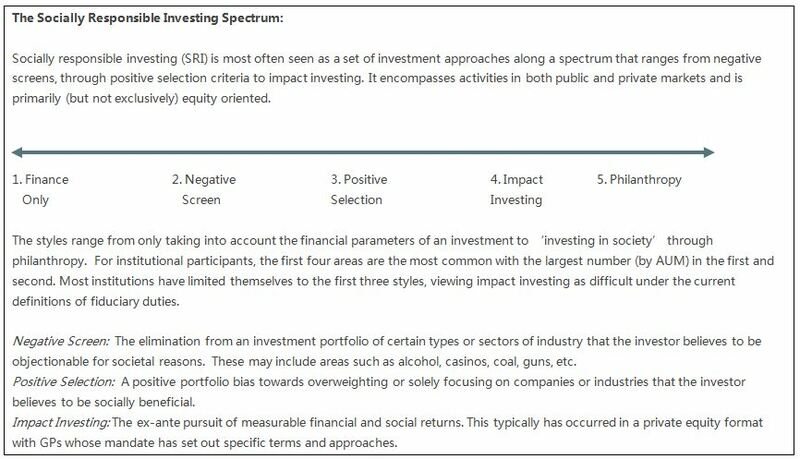 An example of a more robust taxonomy of decision making can be seen in the approach of the Omidyar Network to triaging different forms of socially responsible investment. A self-described “philanthropic investment firm” rather than a “one-size fits all” firm, they have developed a codified framework that positions possible investments along a returns continuum that will be familiar to many professional asset managers. Having such a rigorous framework allows institutions to gain confidence and thereby focus their investing at the ‘commercial’ end of the continuum. The ability to more accurately characterise returns, to consider non-financial factors in the capital allocation decision, and to coherently describe one’s investment style to a broader investing audience represent small but foundational advances in clearing the way for institutional funds to deploy assets to the SRI sector. Our research has shown that since 2005 and the development of the United Nations Principles for Responsible Investment (PRI) standard, fund managers have faced mounting pressure from investors to include social considerations in their investment decisions. Beyond the relatively passive public market screening approaches in styles 1-3 above, too often the mismatch in size between institutional relevance and the receiving vehicle has frustrated both sides. Institutions need to deploy significant sums (often in excess of US$100 million per manager) to have a meaningful impact on expected returns while historically SRI or impact funds have been more scaled to meet the needs of retail and mandated investors. Source: Zeisberger, Prahl & White. Mastering Private Equity. Wiley, 2017. In this context – with diminished legal risks of participation, the presence of large sums of investable capital, stakeholder and social pressures to broaden investment style choices – the emergence of large scale, professionally managed and structured socially responsible investing platforms makes sense. The professional asset management industry changes slowly. Much of what is outlined above was aspirational three years ago. But now it is likely to continue, given the societal pressures for a more thoughtful form of capitalism. However, expectations that the assets under management (AUM) devoted to SRI styles as a proportion of overall assets will see a rapid step change are unlikely to be met. On the surface, SRI is becoming mainstream. Currently, the UN sponsored PRIs have been signed by more than 1,700 professional market participants representing approximately US$60 trillion in managed assets or roughly 80 percent of the global total of professionally managed assets2. Few of these funds, however, actively manage their SRI position. The most recent biannual study by the Global Sustainable Investment Alliance found that two thirds of the US$21.4 trillion invested in SRI strategies was composed of relatively passive negative screens3. The conservative nature of the asset management industry is such that a migration or rebalancing from passive SRI strategies will be cautious and facilitated by the changes that are noted above. Notwithstanding the step change in scale for an Impact fund that a successful close for the TPG/Rise effort would indicate, US$1 billion represents a drop in the bucket for the industry. As a leading indicator of growing maturity, it is useful, and a successful close is likely to prompt a competitive response from other firms. This, in turn, is likely to drive another change that the industry needs to see in the impact sector: consolidation. Currently, most impact investing funds are sub-scale. The reality of an average AUM measured in the tens of millions of dollars for the majority of active SRI managers means that fund-level economics are challenging. In addition, investors’ concentration constraints mean that the modest sums that they can deploy in those funds render this exercise futile at a portfolio level. Industry consolidation, where existing mainstream asset managers buy or integrate specialist SRI general partners, should be expected. The industrial logic of shared fundraising, compliance and reporting and the bringing of specialist abilities in-house should make this compelling for both sides and are likely to encourage greater institutional participation. Other areas which could enhance institutional investment flows include an increase in the number of institutional scale offerings from managers with demonstrable, successful investment track records and clearly articulated investment goals and performance metrics; an expanded fiduciary safe harbour for asset managers beyond the pension industry; and continued industry focus on developing products, language and approaches that are pragmatic and coherent. This will take time, but it would appear that the hard work of building an industry is underway and growing. Ian Potter is an INSEAD Distinguished Fellow with INSEAD’s Global Private Equity Initiative (GPEI). Based in Singapore, Ian focuses on Impact Investing, Commodities and Private Equity. He is also the Managing Partner of Lion City Capital and sits on several Boards of Directors. Follow INSEAD Knowledge on Facebook and Twitter.